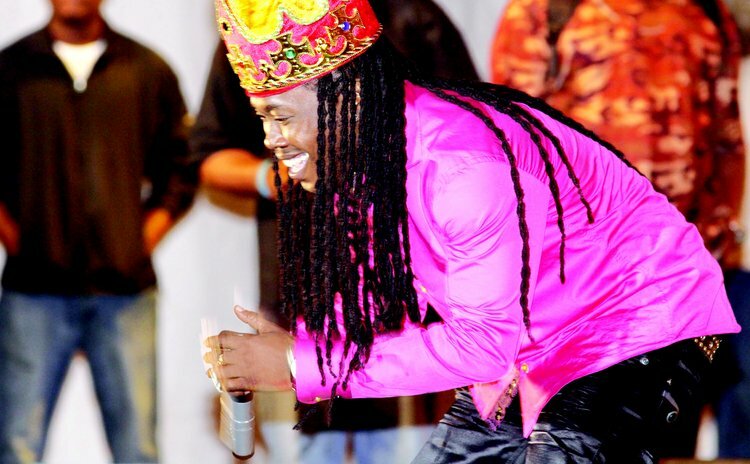 Dennison "Dice" Joseph wins the Calypso Monarch title for the sixth time. There's Dice and there's the other calypsonians. No one comes close. Unbelievable. Unprecedented. Out of this world. Undoubtedly, Dice is the Usain Bolt of Calypso. Last Sunday morning at Carnival City in Portersville, Dice was crowned Calypso Monarch for the sixth time. And at the end he said it was rather simple; like Bolt, he has nothing more to prove. "I want people to trust the good in them, simple," Dice said after the show. "Nothing big about it; when you trust the good inside you, something good will happen, man." In the first round of the two-round competition, Dice was the first performer and he set the bar so high, with superb rendition and articulation, the other nine competitors had much difficulty achieving that standard. He sang "Beat me Mama", a song about a young man's fear of revisiting the prisons at Stockfarm. "They say one term in prison Is followed by another one And I don't want this road to be The path I travel on Beat me Mama, beat me. He delivered the song, penned by Pat Aaron, dressed in prison blues. With "Papa is You", Ras Kelly, De Ghost in his former life as a calypsonian, had a difficult time following Dice's footsteps as the second contestant in the competition; but he performed creditably as a paro scavenging for meals in garbage containers while "Papa", the drug baron, lives in luxury. "The way all paro suffer, Papa you have to pay", he sang. But Kelly, who's also the president of the Dominica Calypso Association, did not match round one's performance in round two with a song entitled "De Shoe Squeezing Me". Electra, a first timer to the finals and also the only female contestant last Sunday, demonstrated "A Woman's Worth", by a wonderful performance with that song and with "I have a Dream", but she may have to toughen-up in the future to excel in the rough and tumble of the Calypso Finals. In the absence of Dice, Karresah would have easily walked away with the crown; he was that good. But by now he must be hoping Dice takes some "Gentle Rest" soon, although not literally. Dressed as an undertaker for his first song, the former monarch shocked the crowd, estimated at 10,000, with a superb performance with a song about deaths at the Princess Margaret Hospital. But in a two-song competition Karresah's second song "De Water Bag Burst" was strong but not strong enough to beat Dice's "Remember the Patriots". "The show is over," said commentator Ossie Lewis on DBS radio after Dice's rendition of "Remember the Patriots". So, unfortunately, Karresah placed second and in the process gave birth to a red baby. Poor Soul Puss. Someone should have advised him to stay out of the Calypso Finals because he was obviously unprepared. At the last minute, the veteran calypsonian was asked to replace Ghetto Prince who underwent emergency surgery on Friday at the PMH for a raptured ulcer. But, as he sang, "Money Matters", especially these days, and that may have influenced Soul Puss to take the plunge. He almost drowned. Lewis described his performance as "a sorry sight for a great calypsonian". Webb placed third and De Bobb was fourth.